I’m the broad behind Broadside, Caitlin Kelly, a career journalist. You’re one of 21,185 followers, from Thailand to Toronto, Berlin to Melbourne. A National Magazine Award winner, I’m a former reporter and feature writer at The Globe and Mail, Montreal Gazette and New York Daily News, writing freelance for The New York Times since 1990. My website has clips, resume, and dozens of useful writing tips. Please follow me on Twitter at @CaitlinKellyNYC and Instagram at caitlinkellynyc. Six of my posts have been Freshly Pressed; here’s the second most recent, about why saying thank you is so important. I offer webinars, ($150 for 90 minutes) and individual coaching ($250/hour) — in person here in New York, by phone or via Skype, helpful for bloggers, freelance writers, new or aspiring non-fiction authors and public relations pro’s, with lots of practical tips, insights and advice. Students find my coaching highly focused, practical and immediately useful. 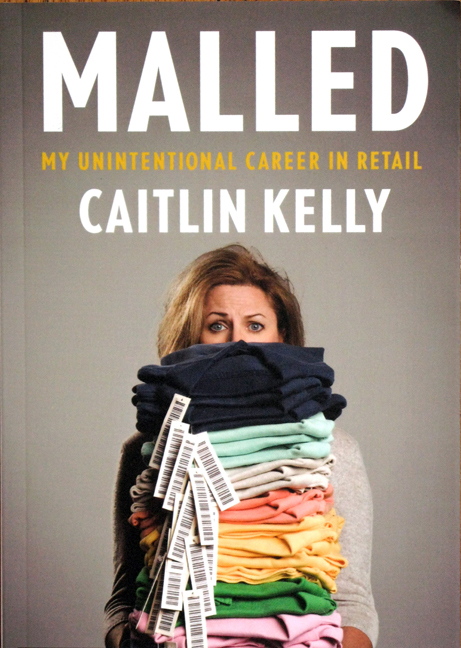 My latest book is “Malled: My Unintentional Career In Retail” , a memoir of selling clothing in an upscale suburban New York mall. It’s a no-holds-barred look at life behind the counter — and a detailed analysis of the American retail industry, the nation’s third-largest, and biggest source of new jobs. You can read some of it here, and buy it here. It’s also available as an e-book. A lively and experienced speaker, there’s a link to my most recent talk at the University of Minnesota on the About page. 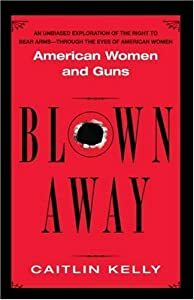 My first book “Blown Away: American Women and Guns”, includes original interviews with 104 men, women, and teens from 29 states. It’s a clear-eyed, neutral look at why, how and when guns and women intersect. In 1998, I won a Canadian National Magazine Award for humor for an essay about my divorce; now re-married to Jose, a former New York Times, Pulitzer Prize-winner photo editor. Born in Vancouver, raised in Toronto, I’m a University of Toronto graduate, living since 1989 near New York City. I live to travel, 42 countries so far — the most recent working trip, March 2014, to the Caribbean coast of Nicaragua with the oldest NGO focused on water, sanitation and hygiene, WaterAid. I speak French and Spanish and have lived in Toronto, Vancouver, Cuernavaca, Mexico, London, Montreal, New Hampshire and Paris. U of T graduate right! That means you understand more of Marshall McLuhan than most of his readers right? I suppose so. . . I loved today’s entry on Eat, Pray, Love, I just don’t understand why you ended it that way with a ? This is a most profoundly earnest topic worthy of great reflection. I’m struggling to find a way to appreciate what Julia Robert’s character by embracing such autonomy while married. I have read many other similar stories almost all end depressed that they never had marriage and children. Their is a tremendous theology needing quarry in this topic. I kinda dread having to spade it alone. Perhaps such radical autonomy ought to be done before one get’s married. Do we not have a responsibility to discover such identity, places before ‘commitment’. What about the culture of the household and the identity of children. It seems to me that most of feminism erroneously begins from the false premise of masculinity (autonomy), why ignore the intrinsic worth of feminism? Why begin from w/in the house of idealism anyway when discerning freedom and gender? Anyway, nice blog, and great post. I loved your post about Eat Love Pray. I think whenever anyone, (but especially women) are on a journey to discover who they really are beyond the cultural roles society allots them, the people who are identified into those roles have respond by trying to get the person back into that role by discrediting the veracity of what they are doing. And they often resort to all sorts of nasty methods. The methods go from various forms of name calling, criticism or bigger control factors like in certain Fundamental Muslim countries where they believe it is OK to stone a women to death if she does not conform. Much of this is because people the people who like being in those roles (which for some of us are cages) feel threatened by those who find joy in greater self wisdom. Laurie, thanks. You’ve summed it up eloquently. I am appalled at the finger-wagging. Hi, I loved your blog! About Eat, Pray, Love . . . mid-life crisis is a reality for so many people. Regardless of having a partner, a home, a great job, and kids, a crisis arises when one takes a step back and realizes that the material things aren’t making them happy. When you think you have it all and still aren’t happy, then you know it’s something so deep that it warrants deep reflection. The type of crisis that I’m referring to is when we haven’t found our purpose. Having material things or a mate doesn’t define our purpose. It’s my belief that searching within (praying)is the only way to find out what that purpose might be. I didn’t see the movie, and to be honest, I don’t have a desire to see it. It’s just that this movie has received such negative reviews that it makes me wonder what kind of people are on this planet. One never knows what goes on in another’s mind, and until that person has walked in the other’s shoes, they never will understand. I don’t care what a person has in terms of “things”, when the crisis hits, it hits in a big way, and one must do what they have to to find their answers. I think America (those who are posting negative comments and reviews) should show more understanding. I would use the word empathy, but then if they had empathy, they would totally get what this is all about . . . having lived through a crisis of their own. Thanks for visiting and your comments. It’s been an eye-opener to see what level of…passion….Gilbert’s story evokes. Babes and Bullets: Will I get Lucky or Will I Get Shot? I hope you have an opportunity to take a look at my posts. But in any event, I want to thank you for your piece on Eat Pray Love which I found via the Freshly Pressed tool in wordpress. I like your style and your brash wayu of speaking your minds. Thanks. Brash is my middle name. Hi there! Nice to find your blog and see your comments on my blog. We’re thinking about buying a cabin in Sullivan County — not sure if you live near there — but totally love it up there. I am not anywhere near there — much closer to the city. But it’s gorgeous. Happy hunting! Thank you for your comment on my recent post! I read the ID post you linked and found myself actually nodding in agreement through the whole thing. Lots of common ground, I think. Also wanted to say that a comment on my writing, from a journalist like yourself, means a lot to me. Thank you again and I look forward to reading more of your writing! Amamzing guidance for wannabe writers like me. Thanks a lot! Greetings from India. You are one rad broad! I came across your featured press ‘tips for writers’ and couldn’t agree more with the important points you noted. And the fact that we are in agreement gives me great confidence 😉 I may be on to something after all …. Thanks for sharing your talent and wisdom! You seem like one busy lady, but if you find yourself battling some insomnia or general boredom, you are more than welcome to stop by Bath Tub Fortress, red pen and all … I would be honored for you to criticize every and any thing I have posted. And until then, I will be loyally reading your creations! I think there’s a T-shirt there! Thanks much. I’ll try to come by and visit. Just stumbled upon you as I was sitting my bum down to a couple of hours of revision – a little procrastination never hurt anyone (she typed tentatively). Thanks for a little shot of motivation and hope. Ten Ways To (Seriously) Improve Your Writing um, isn’t that a split infinitive in your title? i know, i know, pretty archaic grammar but we perfectionists die hard. Thanks! This is a wonderful(and informative)blog. Yes, the ‘bum in the chair’ – I have a background in Creative Writing from Toronto and U of Victoria, but the big problems is just that. Have decided to blog excerpt of my book project – book PROJECT sounds less assuming, than book. Something exhilarating about 82 people reading my first blog – even if I directed 41 of them to do just that. I did English at U of T. Call it a book Be bold! Name it, and claim it. I love “bum in the chair.” I spent way too much time there, but that’s what get’s it DONE. I’ve never written somewhere lovely and scenic or a cafe….At home. It’s nice to read about you. We share many interests: travel, cooking, reading, sailing, dance, and an obsession with beauty and great design. I love that you speak French (I have family living in Versailles, France and visit as often as I can). How cool that you attended the New York School of Interior Design. I’m sure that experience gave you some new perspectives. I hope my blog will bring you some of the same pleasure that your site brings me. Ayez un jour merveilleux! Kate, indeed! Glad you found this site and I look forward to visiting yours. I am my happiest when in France, maybe because there I feel they value all the things in this list: they invented ballet, are amazing sailors, adore and value beauty and order and create great food…The U.S. (now?) seems focused on $$$$$$$ and power and status. Not interesting to me at all. Stumbled on your Blog and found the frank, to the point direction invigorating. I have wanted to write for years and will continue to read you while I move forward in the endeavor. Thanks. I picture myself there where you are. I am from a small town north or Seattle, Washington on Puget Sound. But, I am here in Los Angeles and when I read posts like yours, it pains me to think that I do not belong in this huge city that swallows people whole, yet I am here. How to go home? Stuck! In so many ways. I see the exquisite Pacific Northwest and its warmth and know my calling is there. My “aliveness” is there. The spiderweb of living here is stifling and my life purpose drains. My job? To get out, to get home, to save myself. To write and get this first book out before I choke on it. Your communications have struck a responsive chord. A flicker of what I am meant to hear and feel. It is warm connecting with you. It is good to read your words that empower, I am sure, many others. The Daily News is in the book….not a pretty picture for those of us who are less Hamill-esque. But I hope you enjoy Malled! Thanks for coming by. I came here after following your comment on Litlove’s blog (can there be a grander recommendation?). Love what I’ve read so far – especially the scents and Grasse on your home page, though I couldn’t find where to leave a comment there. Thanks! I’m so glad you came by to visit. You can comment on any post by going to the bottom of the post…that’s where the comment button is. I am so delighted to find you Caitlin. I will comment on your posts. The first one I read is your April 1st post “Would you Rather Be Productive Or Creative?” Love it and I definitely prefer to be CREATIVE first in order to be inspired and find the words walking through the maze that is my brain then write them first with pen to paper. Gosh! Thank you ever so much for taking the time to look at my images and send a response, I’m thrilled to meet you. Stumbled on your article on productivity versus creativity and absolutely enjoyed the read. Look forward to reading more. Just found this and it looks terrific. Can’t wait to pore through more posts. You really seem to capture the spirit of the writing life in a way that’s inspiring. On a more mundane note, how do you add the images to your posts? I’m an advertising writer, but am now starting to pursue self help writing and bloggin. I’d like to use this format for my new blog and can’t quite figure that out. Also– when you list the keywords at the top, I assume that’s a device to help improve your search rankings? Any tips on using this Depro Masthead format would be most appreciated! If you go to the page that allows you to post new pieces, you will see a pace marked “categories” (the titles above my posts in italics) and tags, the ones in gray letters….You have to choose both and add them to every post in order for search engines to find you and them. The photos are from Zemanta…all copyright free. Another way I try to keep my search rankings higher is adding my name the name of my book to each pile of tags. The Masthead is a nice theme because you always have three posts easily visible at once….I think it gives readers a better taste of what you do and, as you can see if you look at last week’s posts, if there’s a theme having three side by side on the same topic over a few days as a story develops makes it easier to follow. You commented on my post (http://ericatakesovertheworld.wordpress.com/2011/08/01/the-top-10-annoying-customer-habits/) about a month ago, and I just wanted to thank you for that. As a brand new journalist it is really hard to find that feeling, when I know I’m doing something right. You definitely helped me there. I would love to get a copy of your book and learn more from your lead! I think you’re a really remarkable person and really fascinating. Thank you again. Thank you for dropping in on my blog, Caitlin, and for your comments. I have just read a few of your posts, and love them; especially the one about courage. We can go a long way if we have the courage to do what we know is the right thing – to help, to support, to encourage those on life’s journey; especially the weak. Like you, I dislike – no, I detest – the way everyone in the public eye nowadays becomes a hero. Heroes are not those who do well at sport, those who gain fame for their acting, or politicians who are just doing their job. Heroes are those who give their all, beyond the norm, in order to do good to and for others, perhaps at some risk to themselves or their reputation. The word hero is horribly over-used, especially in the States. I think it’s because it’s such a huge place and people are hungry for some way to stand out. Smaller, quieter acts of courage do not get attention. but are likely making change in important ways. I couldn’t agree more! The American tendency to glorify people for their fame, rather than honouring people for doing glorious things, really rankles. Thank you for calling by the Legion. I have no idea how you found the thing. How did you? I had a quick gander there at your “15 tips” and also the “refusing help” posts. Really excellent stuff. I’m now terrified of you! Still, glad you passed by and hope you’ll call again and I shall be sure to return the favour. I had a quick gander at your “15 tips” and also your “Refusing help” posts. Excellent stuff. As a result, I am now terrified of you. I hope you’ll call again and I’ll make sure to return the favour. Nothing to be terrified of! I found your blog the way I find all the blogs I like or commnent on…by spinning the roulette wheel under a random topic. I roamed around under the tag of “nature” and found your gorgeous and highly unlikely photo of an aurora borealis in…Ireland? Who knew? Now, I do! Lovely. Well I’m glad of it. I read O’Casey’s play last week and came across “the aroree boree allis” and it stuck. Ireland is 53 degrees north, you know – about the same as Newfoundland, so we are quite northern. If we didn’t have that lovely Gulf Stream keeping us warm we’d be an ice box! I love your book Malled -I wondered if you would like to write something to appear on our PLAZA London blog – a blog concerning public space, especially malls. It would be great for you to talk about your book, we have a wide readership and I think your sense of humor would be well received! Have a look at http://www.plazalondon.wordpress.com and let us know what you think! Thanks…sounds like fun. Let me check it out today and get back to you. Hope you like it! If you, do, please “like” our FB page, malledthebook, and write an amazon review? It all helps! Oh, yeah! 🙂 There’s a chapter called Customers From Hell you may well enjoy…and probably can beat with your own war stories! Nice to come across your blog, and thanks for your recent comments. Thank you for commenting on my blog post…it is so interesting to learn how other countries such as Canada compare to the U.S. when it comes to women “bullying” other women with their critical blog posts and blog comments. I am pleased to make your acquaintance in the blog world and look forward to your book and future posts. Do you know that Marymount (two blocks from my home, where I taught a class one semester) became a campus of Fordham and is now owned by EF, a Swedish language school? Now it’s filled with students who come here from all over the world to learn English. Canadians, in general, are far less amused by and interested in conflict than Americans, in every way. It’s a major cultural difference. How neat to hear a bit of local history! The campus looks probably very much as you knew it…no new construction and nothing removed or changed externally. Caitlin, thanks for stopping by http//theviewfromhere.ca and leaving your mark 🙂 Wow! You ARE accomplished and a former Torontionian to boot. Two big checks. I love what you have going on here and I am glad the guys can stop by to chat occasionally. Sorry I missed the recent Freshly Pressed moment. I loved that blog, but all your writing makes me think and feel a little differently than if I hadn’t read it. Congratulations! That’s about the greatest compliment you could pay me. Thank you. Do you have a “Follow” Widget on your blog somewhere so I can follow you? You’d think I’d know that…and there must be, as I’ve got a ton of followers…I have to hunt it out…! If you go to the full home page (with 3 posts on it), there is a follow tab on the upper left hand corner…. Hover cursor over blog name at top left of screen. A window will open up. Hold mouse cursor down on widget and “drag” it to your sidebar. I put it on the top. Just below the “search” widget so people could find it easily. I hope you read “Malled” and enjoy it. It is satisfying but I write for a living, so it’s work to me. Alright. Malled just went on my reading list. I work retail currently, and sometimes you just need to know that other people understand what it’s like. I think you’ll find a lot of it very familiar! I just heard your YouTube keynote speech. It was excellent and I will check out the book despite never having worked in retail–or perhaps because I have not. I knew very little about you when I first “followed” and now have great regard for your writing and impact. Thanks for your erudite and fun blog as well! Thanks so much! I’m delighted you made the time to watch the video (which was aimed at retail students) but there’s a lot in Malled that any shopper can relate to. Clicking around the blogsphere and found your blog. I do love funny women, and love love funny women writers. Will be back to read your work. Hello Career journalist and author. This blog complete informative and nice for me i m still student to learn all the topic what`s going on in this Earth and environment your site is amazing and All post are well written and i really love to read posts..
I’ve been following your blog for awhile and really enjoy it and wanted to let you know I nominated you for a Very Inspiring Blogger Award. Thank you for your contributions. All the best. I am a journalist student. What was it like working at the New York Times and New York Daily News in your career as a journalist? I freelance for the NYT and was staff at the News for a year. Freelancing for the NYT has, overall, been a pleasure — it helped me win my second book deal and I’ve written more than 100 stories for them. I enjoy the variety of the work I do for them and it’s a good way to get known in the industry. The Daily News was a wholly different experience…with a very different audience. It taught me to write tight and write differently. I enjoyed the work a great deal, but not the newsroom. ¡Qué gusto encontrar su blog! Je suis Canadienne aussi and I’m married to a Mexican 🙂 I find “professional writers” intimidating. It’s hard to compete for the same attention. As a “debutante” blogger what advice would you give to have a strong presence? Thanks…That’s a long long answer. Two suggestions — I offer a 90 min webinar for new/ambitious bloggers; details at caitlinkelly.com/classes…arranged to suit your schedule. Thanks, Rita….lots in the archives. Not sure how to do that….most people just “follow”..?